The City of Yokohama is just south of Tokyo along Tokyo Bay. 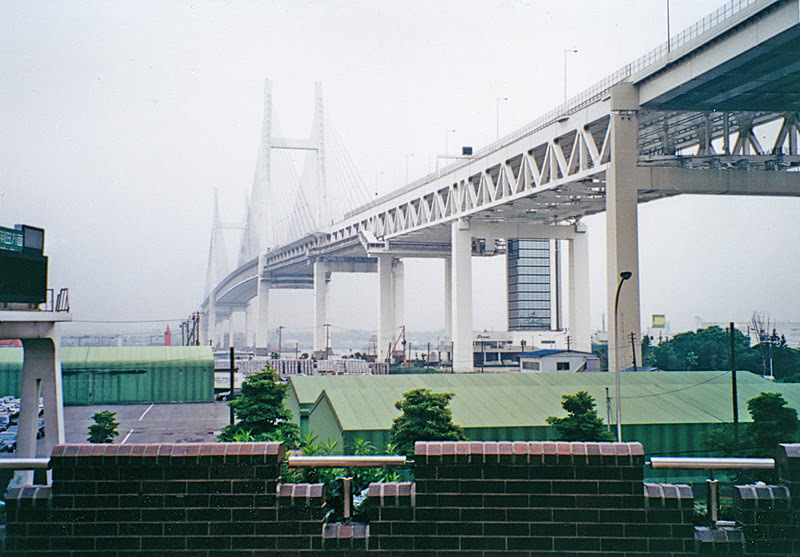 The Yokohama Bay Bridge is a viaduct that includes a cable-stayed bridge that connects Daikoku and Honmoku Piers in Yokohama Harbor. Yokohama has a busy port clustered with piers and human-made islands that were dredged from the Bay. The Yokohama Bay Bridge is part of the Shuto Expressway. The Japanese are proud of their bridges and so bridge owners provide parks, walkways, and viewing platforms so that visitors can appreciate a bridge's form, much as Hokusai did for the Ryogoku Bridge 200 years ago. The Yokohama bridge is a symbol of the City of Yokohama and it was carefully designed to appear beautiful from the parks and hills surrounding the bridge. Moreover, a walkway and viewing platform have been provided on the bridge. The Yokohama Bridge has a double-deck truss superstructure with six vehicle lanes on the top and bottom decks. The bridge has 55 m (180 ft) vertical clearance to allow big container and cruise ships access into Yokohama Harbor. The suspension cables have a fan arrangement between the towers and the girders. The main span is 460 m long and the side spans are 200 m. Because this area has large earthquakes, the bridge was designed to allow the heavy superstructure to move out of phase with the towers during strong shaking. Japan had a huge spurt of infrastructure development in the 1980s and 1990s (much like China is going through today). The Yokohama Bridge was completed in 1989. Tokyo Bay Bridges: Yokohama Bay Bridge by Mark Yashinsky is licensed under a Creative Commons Attribution-NonCommercial-ShareAlike 3.0 United States License.